Its model number and name are #003 / Vision. Character Bio - Jonas is the successor to the Vision, accidentally created by Nathaniel Richards (aka Iron Lad) when Nathaniel uploaded the then-deceased Vision's operating system into an advanced 30th-century suit of armor. Vision's operating system took control of the armor and formed its own persona and identity. Though his operating system was based on Vision's, his brain patterns are based on Iron Lad's. His technology is more advanced than the original Vision's, but he lacks Victor Shade's wealth of experience. The new Vision joined the Young Avengers and christened himself Jonas. Perhaps as a result of the shared brain patterns, Vision and his creator both fell for the same girl, Cassie Lang. When she was killed by Doctor Doom, Iron Lad wanted to go back in time and save her, but Vision opposed Iron Lad, and Iron Lad killed him for it. Vision has been memorialized with a statue at Avengers Mansion. As an Android, Vision has these Android Synergies. As a Rookie, Vision has these Rookie Synergies. 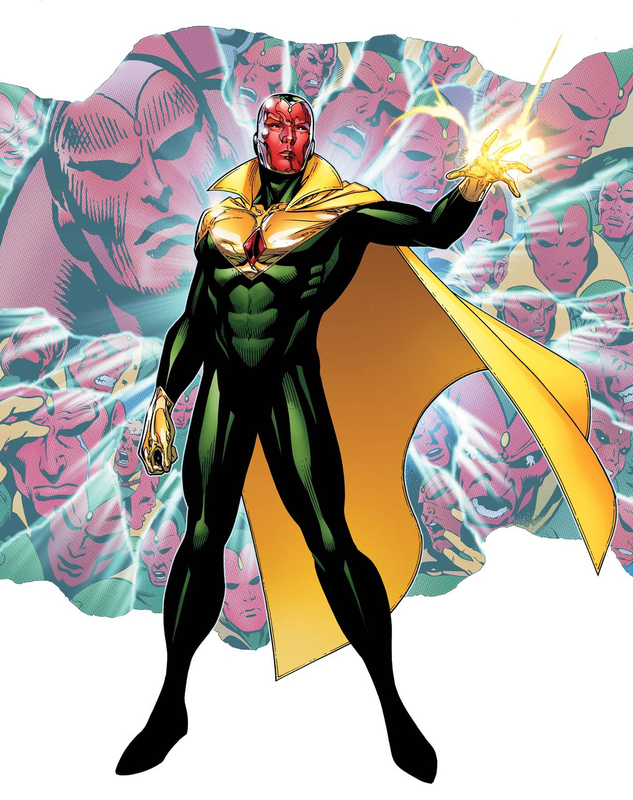 Vision may move Rookies with his Fail-Safe Planning special power. Current Rookies. As an Android, Vision interacts differently with these special powers. As a figure with the Super Strength special power, Vision interacts differently with these special powers. As a figure with the Flying special power, Vision interacts differently with these special powers. Vision's Twin Solar Beams Special Attack is less effective against Kryptonians. Current Kryptonians. Vision can move through all figures and obstacles such as ruins, and is never attacked when leaving an engagement. Vision cannot be targeted by opponents' non-adjacent figures for any attacks or special powers that require clear sight. Vision may not be moved by any special power on an opponent's Army Card. You may only use this special attack once per game. Choose up to two figures to attack. Roll 3 attack dice once for all affected figures and add 2 automatic skulls to the result. Affected figures roll defense dice separately. When a Kryptonian figure is attacked with this special attack, the most wounds it can take is one. When an opponent destroys any other Unique Hero you control or uses a special power to reveal, remove or rearrange any of your Order Markers, you may immediately choose up to two Rookies you control and move each chosen Rookie up to 4 spaces. Vision may be one of the chosen Rookies. You may not choose either Rookie for this special power again for the rest of this player turn. Figures moved with this special power will not take any leaving engagement attacks. Last edited by Ronin; February 3rd, 2018 at 06:45 PM. Last edited by Ronin; January 21st, 2018 at 02:34 PM. This one hasn't been talked over too much yet, but I thought he'd be a good candidate to round out the Young Avengers booster. I originally wanted to do Contingency Plan, because Jonas' knowledge of the Avengers Failsafe Program is what gets Speed recruited into the team (and it suits Jonas generally). That said, Speed is already representing that on his card and Contingency Plan wouldn't mesh well with him, so I didn't want to do straight-up Contingency Plan, leading to the current riff. The Solar Beam SA is a shot at a charge effect, with the Kryptonian thing for flavor. Jonas always weirded me out. Weird robot guy. There, I said it. Seems like a solid take - the Vision, like Superman, has enough goofy powers to fill multiple cards. Did Jonas ever use the Solar Beam, or is that an informed power by virtue of Victor Shade? Either way, I feel like it wouldn't play quite right, since "big on turn one, small later" is sort of the opposite of a "charging" power, you know? I'd use Markers, or maybe a pool of dice you can "spend," if that's the direction you're into. He used the beam in his spotlight issue, at the very least. I'd rather not do anything with markers here. We could do something a little different with the implementation, but big up front and less so later makes sense to me. It's a weapon that tends to be a 'one big shot' kind of thing. Start the game with 1 attack die on this card. At the end of each round add 1 additional attack die to this card. When using Solar Beam Special Attack you may remove any dice on this card and add them to the attack. The per-round recharge thing is secondary and I'd definitely scrap that part before the part where it's more powerful the first time you use it. The one time I specifically remember him using it (and I feel like this is a representative case), he's got charge already built up because it's a passive solar-powered thing, he expends that charge on a big shot, and then he can't use the beam again right away. That's what I'm aiming for. I let it recharge a little bit in the current draft mainly just to give it a little more utility. Oh, pre-emptive note to the CRB types: I do need to tweak Failsafe Planning so that it doesn't trigger when you destroy your own figures, so that you can't bring a bunch of Fire Ants or whatever and murder them to launch your Rookies across the board. Maybe also either a once-per-turn restriction on the whole shebang, or just a restriction that you can't choose the same Rookie twice in one (player?) turn, to further prevent swarm abuse. I'll tweak the wording when the breathing period is up. If you have not used this Special Attack yet this round, add X to the Range and Attack numbers of this Special Attack, where X= Your highest revealed order marker. I don't like the kyrptonian call out, he is Marvel and Superman is DC. I do get what you are going for on the first time is the best attack though. If he charges it up via 'soloar cells' then it would take hours to fully charge up and not seconds or even minutes. I'd consider just going with one big once per game attack then. You may only use this special attack once per game. Choose 5 spaces in a straight line from Vision. All figures on those spaces who are in line of sight are affected by this special attack. Roll 3 attack dice once for all affected figures and add 2 automatic skulls to the result. Affected figures roll defense dice separately. The Kryptonian call-out feels like a must-have to me, for the same reason a sonic scream makes Venom wig out, whether it's Banshee or Black Canary doing the screaming. The crossover part of C3G is one of the things that makes it so cool, and I don't care if two characters are from different universes when they're on the board together. I'm okay with making it a straight-up once-per-game thing. I'll have to mull over the Optic Blast type effect and weigh in on that tomorrow.